The Sansovino frame is a distinctive Venetian pattern of frame that takes its name from the architect and sculptor Jacopo Sansovino (1486–1570) who worked in Venice from 1527 until his death. Although Jacopo Sansovino almost certainly did not design the frame type named after him, the pattern draws upon decorative motifs commonly found in carved or stucco wall panels and ceiling decorations in Venice at the time when he was city architect, and has come to symbolise Venetian style of that period. Ceiling of the Scala D’Oro, Palazzo Ducale, Venice. Designed by Jacopo Sansovino, decorations, circa 1575, by the workshop of Alessandro Vittoria, (1525-1608). The inventor of the ‘Sansovino frame’ is more likely to be the sculptor Alessandro Vittoria, Sansovino’s most gifted pupil, as noted by Nicholas Penny in the accompanying catalogue to the exhibition, Frames in Focus: Sansovino Frames, The National Gallery London. Vittoria’s vaulted ceiling, for the ceremonial staircase, known as the Scala d’Oro, of the Palazzo Ducale, is exemplary of the style. Richly sculpted in stucco and painted white with gilded highlights, the ceiling compartments are framed with garlands of fruit and leaves linked by exaggerated volutes and interspersed with putti and grotesque masks. The distinctive characteristics of the Sansovino frame are the intertwining scrolls and volutes and the contrast of the rich dark brown colour of the walnut, or soft-wood coloured to appear as walnut, and the gilded highlights – an effect called lumeggiato in oro. The frame pattern on more elaborate frames may be further enriched with swags of fruit, putti, grotesque masks and flanked by ‘terms’, often female. Italian, Venice, circa 1575, carved pine Sansovino frame, coloured to imitate walnut, with gilded highlights & volutes infilled with flutes, & centre rosettes. The carved elements of the frame illustrated above are assembled on a pine back frame jointed at the corners by a half lap secured by two square pegs. 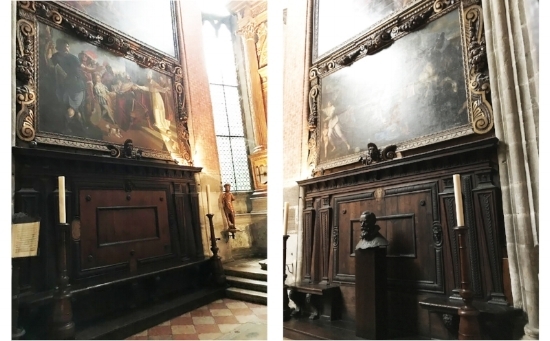 The two large paintings by Giovanni Contarini and Tizianello, Saint Ambrogius prevents the emperor Theodosius from entering the Church, painted in 1590’s, on the side walls of the Milanese chapel in the church of the Frari, retain their original Sansovino frames. Book published to accompany the exhibition.